1.On June 3rd 1995, Establishing in the south decoration town. 2.From 1997 to 1998,with the rapid development,making the leading enterprise on swimming pool,sauna room,spa. 3.In 1999, company was promoting the "Monalisa"series sanitary ware products into market. 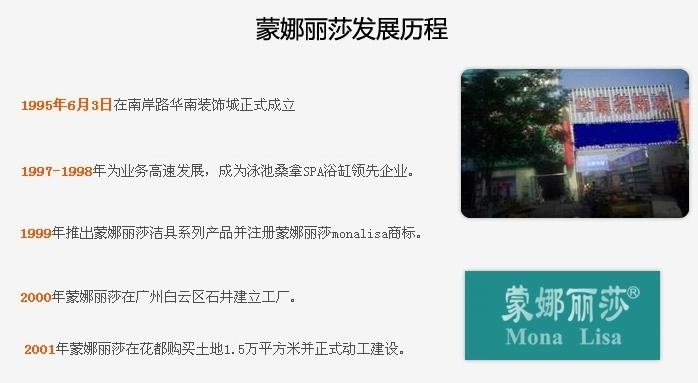 4.In 2000,Monalisa decided to open a factory in Shijing, Baiyun district ,Guangzhou. 5.In 2001,Monalisa bought a area of 15000 square metres and started to building a factory. 6.In 2002 Monalisa was moving to Huadu district, Guangzhou formally. 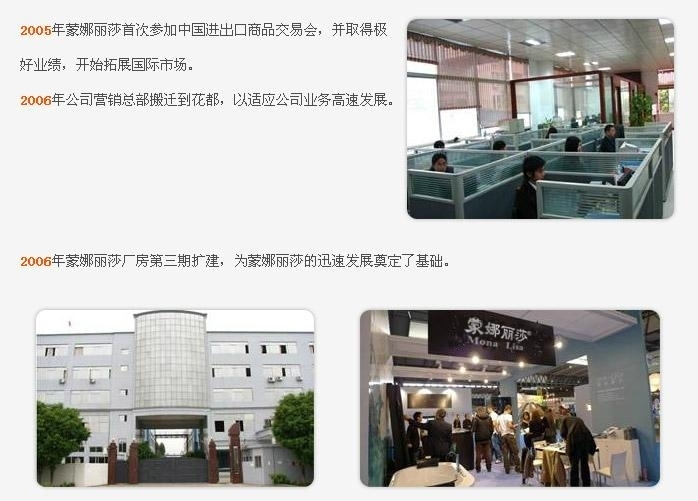 7.In 2003，the headquarters of marketing and sales established in the second floor of Guangzhou show room. 8.In 2004, the first ourdoor spa of monalisa—M-3301,created. 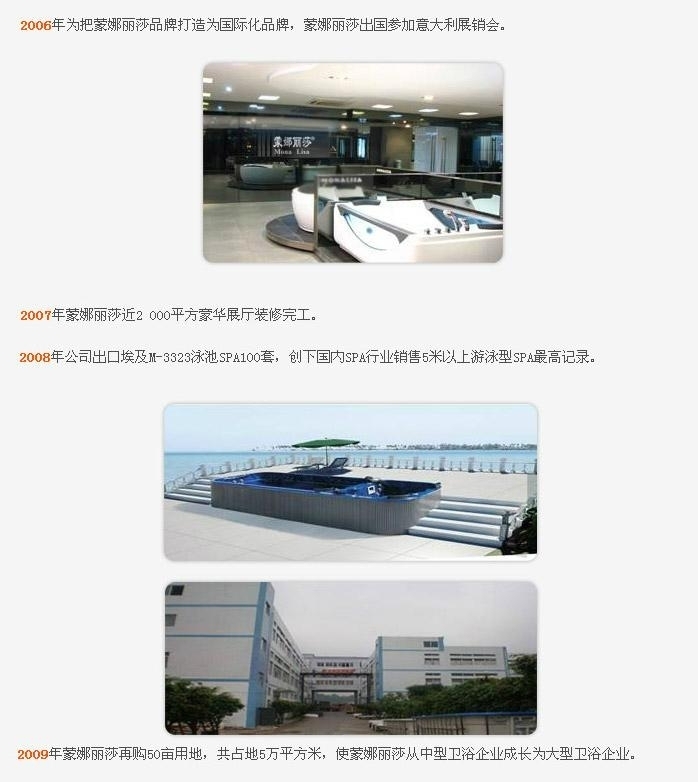 11.In 2006, we moved the office location of Headquarters of Marketing and Sales to the factory, for the sake of service the high-speed growth of business preferably. 13. In 2006, our company attended a international fair in Italy for the first time. Then we established the brand of Monalisa as a international brand. 14. Our luxury exhibition hall with nearly 2,000 square metres was completed in 2007. 15. 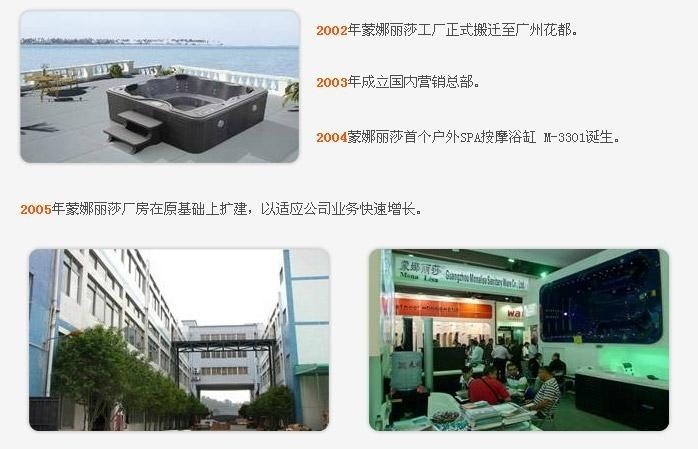 In 2008 one hundred sets of SWIMMING SPA M-3323 were exported to Egypt.. which made the highest single sale record of SPA POOL above 5 meters in China SPA Industry. 16. In 2009 After bought 35000 square meters again , Monalisa expanded from a medium company to a large enterprise with total area of 50000 square meters.